The Chicago Cubs are the best team in the National League. They currently have a 38-25 record, which is good for best in the NL on this Tuesday afternoon. After beating the Brewers 7-2 in 11 innings last night in Milwaukee, the Cubs hold first place in the NL Central by half a game over those same Brewers. This is the first time they've been alone in first place since the start of play on May 1. Why am I writing about the Cubs? Because I need to write more and other than San Francisco Giants games, I watch the Cubs as much as possible. I've written here about how I grew up going to Wrigley, and frankly anytime it wasn't the Giants playing against them, I was rooting for the Cubs. All my friends were Cubs fans, why wouldn't I want to cheer alongside them? Now I'm married to a Cubs fan as well, so you can see it's natural for me to have a rooting interest in the Cubs. I typed all that to say this, I have some thoughts on the 2018 Cubs, and I may write about them in this space from time to time. Most, if not all, of my Giants stuff will be over on TortureCast.com. Like the post yesterday about the bench guys who have really come through for the Giants this season. That's not what I'm here for today, so here's a few quick thoughts on the Cubs from what I have seen so far this season. It sounds cliche, I know it does. But it's true with this team. Some teams roll over and die when they get down a few runs. Not the Cubs. They'd have to be losing by 8 to feel like the game is out of reach and even that's a risky proposition as they proved back in April on a rainy and cold afternoon in Wrigley against the Atlanta Braves. The Cubs were down 10-2 in that game before exploding for 9 runs in one inning and eventually winning 14-10. Last night's victory is another example. The Cubs fell behind early, came back to tie it, and finally burst through with 5 runs in the top of the 11th inning. They score runs in bunches and that makes a team scary. Already this season the Cubs have seven different innings of scoring 5 runs or more. Expand it to scoring at least 4 runs and they've had 12 such innings. You also won't be shocked to learn the 7th inning is when the Cubs score the most runs. They have 49 total in seventh innings. Other than the 46 runs the Cubs have scored in the first, they score the most runs during innings 7-9. Already, the Cubs have 17 wins in games they were trailing at any point. The bottom line is, they can hit. That's why the Cubs lead the NL in scoring, averaging 5.04 runs per game. What allows a team to comeback late in games? That's right, a good bullpen to hold it down until the bats come alive. The Cubs relievers have a 2.73 ERA, 3rd best in the NL. They have only a .202 batting average against them and the Cubs pen has allowed the fewest home runs in baseball, only surrendering 15. And as the Cubs offense has shown, late inning home runs can be a killer. Steve Cishek has been a great find for the Cubs. He's held opponents scoreless in 27 of his 31 appearances and holds a 1.88 ERA, second best in the pen behind closer Brandon Morrow's 1.66 ERA. Another great find in his own right. Those two guys were the best free agents the Cubs signed this past offseason. They will be a key part to sustained success throughout October. Tip of the cap to Pedro Strop (1.95 ERA) and Carl Edwards Jr. (2.88), but my favorite arm to emerge from the bullpen so far this season is Randy Rosario. He was first called up in May as the 26th man for a double header against the Reds. Joe Maddon immediately put him to use as Kyle Hendricks could only make it through 5. Rosario put up 2 shutout innings and it was the best use of a 26th man on a doubleheader roster I can remember. Rosario's next time out he was tasked with putting out a fire. Tyler Chatwood struggled against the Giants and Rosario pitched 2.1 innings and didn't allow a single run. It gave the Cubs a chance to score some runs and they rewarded him with his first big league win. No matter what spot Maddon has need Rosario, he has come through. He's an unexpected breath of fresh air on a team in which the roles are fairly defined. I'm sure there is some recency bias in my assessment here, but it feels like Heyward has been in the middle of some big moments lately. The other night against the Phillies, Heyward took a 2-out, 2-strike pitch and sent it to the moon for a game winning grand slam. It was off a left handed pitcher, just like last night's game tying hit in the 8th inning. That's pretty good for a guy who is hitting .158 against left handers. Heyward is an established leader in the clubhouse and it's nice to see some of the results translate to the batter's box. The other veteran killing it this season is Ben Zobrist. His .290 batting average is his best in 10 years, and overall his stroke, especially from the left side of the plate, seems to be there. When Zobrist is going good, he walks less than he strikes out. At the moment he has both 24 walks and 24 strikeouts. It's shades of the player he was in 2009 and the Cubs hope the pace continues throughout the season. 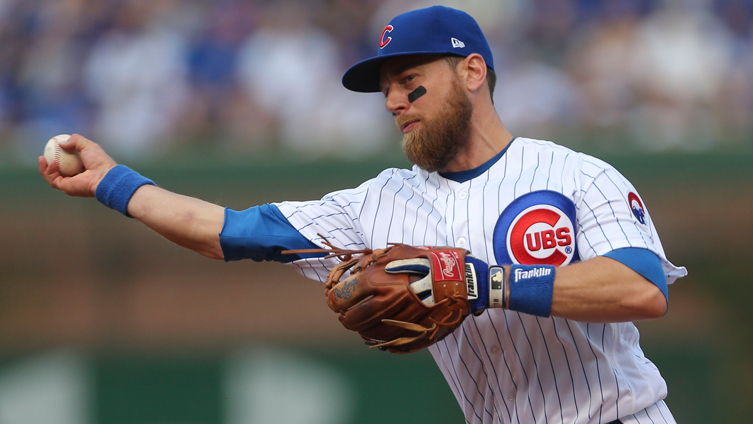 The Cubs are a deep team and it pays to have veteran leadership who is also productive.. Through 63 games, the Cubs have 10 players over 180 plate appearances. That's about 3 per game per player. Depth. They have it. I didn't even mention super pinch-hitter Tommy LaStella or any of the stars. There's plenty of time for that throughout the season. So thanks for humoring me and reading about the Cubs. I hope to have more posts about baseball here as I continue to work on my writing. I've got the outlet, I may as well use it. Follow me on Twitter, @2outhits for more baseball stuff, and check out TortureCast for everything San Francisco Giants.